Our fantastic brand ambassadors were kept busy at Blyth’s Tall Ships Regatta at the weekend, promoting DFDS’ discounted Amsterdam cruise offers alongside the biggest LEGO ship known to man. 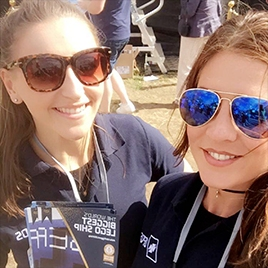 Our brilliant staff manned the DFDS stand at the Tall Ships Regatta event, using promotional materials as well as their own brand knowledge to encourage people to take advantage of the DFDS discounts on offer. The promotional models were also joined at the event by the largest Lego ship on the planet (as confirmed by the Guinness World Records) named Jubilee Seaways. The ship was created to mark the 150 year celebration of DFDS and measured in at 12.35m long, weighing 2,860kg constructed by 7000 people across 20 different countries plus a dedicated team of professional LEGO builders and LEGO fans, using a total of 1 million pieces. The activation was linked to a DFDS digital campaign which featured a competition, with visitors encouraged to take photos and selfies with the LEGO ship using Facebook, Twitter and Instagram with the #WordsBiggestLEGOShip hashtag. Crowd handling was a big part of the day for the staff, with thousands of visitors flocking to the stand to gaze in awe at the futuristic designed LEGO ship as well as hear about the fantastic mini cruise and sign up to the online competition.